Evening all. I was a '96 LT owner a few years ago and tomorrow am flying to Munich to test drive a 1990 Westfalia Florida in the hope of driving her home! My question for you guys this evening is - what should I look out for/listen out for on the test drive tomorrow? Should I get the cowl up and hav a look or is there just no point at this age? Heater! Make sure the boiler works! Its a hell of a lot of cash if not working! Make sure the boiler works! Its a hell of a lot of cash if not working! Back in the slow lane, yeah! 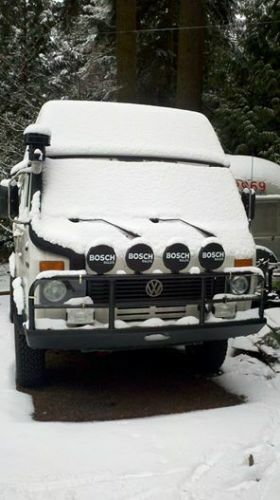 In fact make sure all the westy stuff works! Fridge etc as all prohibitively expensive to replace. I'd be poking and prodding everything and if something is naffed I'd be wanting strong money off! Night heater, boiler, fridge, hob, gas tank switches/knobs, taps and water system and shower must all be seen working. The boiler will cost you upwards of a grand to replace with the equivalent modern version as the one fitted at manufacture is now obsolete. Vehicle furniture - not just the chairs - I mean stuff like roof rack, windows (seriously), latches etc all need to be there as they're not easy to source. Look for signs of damp around the roof lights - it's indicative of leaks. Not a massive job to replace, but new roof lights are around the £100 mark (each), and there 3! Mechanically, check for whining or groaning from the gearbox that indicates potential issues, check for noise that goes away when you press the clutch in (worn clutch release bearing). Check belly pan for oil leaks to the best of your ability. Get the engine cover off and do a visual with a torch - crank oil seals can leak and it will manifest itself as a very oily lower half of motor. Check it starts promptly after the glowplug light has gone out - they all smoke a bit initially, but make sure it clears when warm. Check history to see when the timing belts (there are two!) were last done. It's pricey to get it done. Having said all that, it probably paints a bleak picture, but you have to bear in mind that there vehicles are 20+ years old now. There are good one's out there, but as with anything, if neglected they can be a horror. We've had ours for a while now and we love it - having a shower on board with running hot water is fantastic ................ but we had a fair bit to do. Read this (click here) if you get a chance - it'll give you an idea of what we did. Thank you so much for this chaps - sets me off with just the right balance of reality and fear! And thanks to you Chappy for some reading material for the flight. At the airport now. Will update you live! 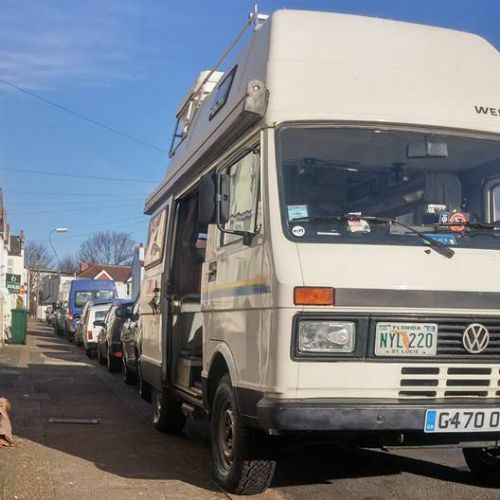 By the way some of you may have stumbled across my LT camper conversion page http://www.loftsites.co.uk/jj.html ...just hope I don't have to go that far with any restoration work this time round! Good luck! I can't add any more other than perhaps don't let on you're going over just to look at the van as it will make haggling more difficult if they know you have a one way ticket. Maybe say you're visiting friends and seeing the van at the same time? So it was a short test drive. Everything inside seemed to work although (as the dealer 'Kapo' had no clue how to work any of the gadgets we couldn't ignite the fridge) and the whole gas system had a recent service certificate. So not much to barter on. All in (with the flight, the diesel for the trip back, peage tolls, tax, insurance and license £7k isn't bad at all is it? More piccies when she's up on the ramp at the MOT centre. Oh, and on that note, what do I need to change? I'm just going to add a rear off-side fog light and some beam benders... will that do it? Chappers? Thanks again so much for your help (so far) - it was invaluable looking her over. Get it insured in the Uk on the VIN number. Then go get it MOT'd. I think you need to send a declaration to HMRC before you register it. Didn't have to when mine came in a couple of years ago, but the law has now changed. Then you can register it. DVLA will help you fill in the forms - most of the details on the form don't need to be completed because of the age of your van. They'll process the application, relieve you of £60 off quid plus a whole years tax and in a week or so will send you a reg doc with your new reg number on it, new tax disc, a form to permit you to get some plates made, and a revised MOT with the new reg number on. That's pretty much it I think ! Excellent - you have got a bargain there by the looks of it. I also recall you need indicator repeaters on the side of the front wings for the mot? If you don't mind me asking, did you just take a load of euros that you got out the bank? The reason I ask, is had you wanted to exchange the euros back to stirling (ie if you hadn't bought it) then you would have been stung for over a grand in fees. 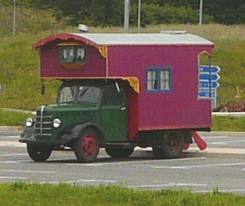 Anyway, I just wondered how folks go about buying a van from the continent. Looks lovely (although I prefer the facelift version ;) ). I hadn't heard that about the indicator repeaters. Figured I'd just do the beam deflectors and rear offside fog and take it in to see what happens. I did take cash. Halifax seemed to imply a no fee rate if I needed to exchange back. Not sure if that would have covered the whole amount though. Mine didn't have indicator repeaters and always passed the mot , not fitted so how can they be tested ? Where's that jealous smiley when you need it? Congrats! Looks like a great deal! It has an upgraded longer awning like mine. That is one of the best features. You can open the front door without rain pouring in. The standard awning ends at the door. $7k is a great price all in if everything works. I'd pay that for another one to have spare for when mine wears out. Want to loan it to me when I fly over this year? :) I've got 1 of 2 known Florida's in Canada.